Are you looking for a convenient, secure, and stable application in this age of mobile apps and web apps? Then the desktop application is what you need! For more than 20 years, desktop applications have been the "face" of the IT industry, and while web and mobile apps are prevalent nowadays, nothing beats the convenience, security, and stability that a desktop app provides. At Outsource2india, we are passionate about desktop application development that can make a meaningful difference in our client's daily business life. We offer a wide range of services which cover whatever needs you might have - from application re-development, creating new software from the ground up, re-platforming, integrating cloud backend, etc. Right from design to implementation, we ensure to meet your desired objectives while taking an Agile Development Approach (SCRUM) for faster development and on-time delivery. At O2I, we excel in blending the latest features within a simple, easy-to-understand UI which is a must for software being implemented for healthcare use. As a result, with the help of reduced operational complexity and increased service efficiency, you can ensure your customers and patients are serviced properly and on time. With various experienced resources and an expertise in multiple development technologies, we are a desktop application development company who can create software using C# development, Visual Basic, ASP.NET, VB.NET, JAVA, Adobe Air, JSON, Swing, etc. The hallmark of our software is the ease with which they can be maintained, and a lifelong update policy which ensures feature compatibility across OS versions. Nowadays, wellness health applications and portals are becoming quite common and offer significant benefits for both healthcare providers and patients. The challenge we deal with is designing applications that engage users while helping them move towards positive lifestyle and behavioral changes. Our user experience team helps to gain a deep understanding of clinics workflows and processes, as well as patient interaction to help design engaging software which our developers then help develop. One of the main pain points for healthcare operators and physicians is finding the correct software which can work with their existing systems. Whether you require a uni-directional or bi-directional connection to your existing PACS or EMR system, we can help develop it within a short time. 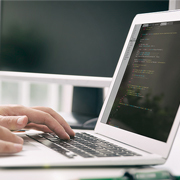 Our interoperable software can also be developed to parse the content of your DICOM files or connecting to your system through an FHIR API. We have expertise in developing software which checks all the requirements for medical standards such as HL7, CCD, DICOM, ICD-9 and 10, etc. As your preferred desktop application development company, we can develop software for a desktop application at any stage of the project. This option is extremely helpful for clients who are getting an entire software ecosystem developed with different parts being worked upon by different partners. Apart from that, we can also help in desktop application testing, development of software add-ins, and creating platform-specific versions of an already available desktop software. At O2I, our process is defined by our expert team of coders and developers who have a minimum of 5 years of experience in working with global clients such as you. From developing full stack applications to cleaning up an existing GUI for better user-friendliness, our programmers are one of the main reason why we are a premier destination for offsite desktop application development services in India. We sit together with the client to understand their application development requirements and analyze the feasibility of the project. Based upon our understanding of the project, we suggest a list of enhancements based upon our current capabilities and experience, which then helps us to draw the final project outline with our clients. Once the final project details have been ironed out, our senior developers begin designing the software architecture based upon your inputs. During this stage, we also finalize the process roadmap. The project commences with us assigning an experienced team of developers who fit the project requirements. A dedicated project manager is also assigned to take care of all your recurring questions. The development team then begins working on the pre-designed architecture. The project, once completed, goes through several rounds of QA and testing to ensure its working correctly and can undertake all necessary functions easily. The application is suitably developed as per the project demands and is delivered to the client along with all required documentation and source code. Based upon our prior agreement, we also begin with the maintenance and update delivery period. Why Outsource Desktop Application Development to O2I? Outsource2india developed a high-quality business networking platform for global businesses to connect and find new partners online. It helped businesses to generate more business, derive business insights, and expand business contracts. We would like to express our satisfaction on the co-operation regarding the development of our web application. The development team did a very professional job. Outsource2india has been a pioneer in developing best quality desktop applications and a series of other web application development services. In the past decade, Outsource2india has played an extensive role in bringing transformative changes to how major healthcare service providers and clinicians outsource their requirements. We are committed to ensuring 100% compliance while building the flexibility to improve your software down the lane by making it open to the cloud. To know more about how we can help you achieve better business performance, contact us right away!